From freeways to firefights to unfathomable depths, vanadium can often be found quietly doing the hardest work. 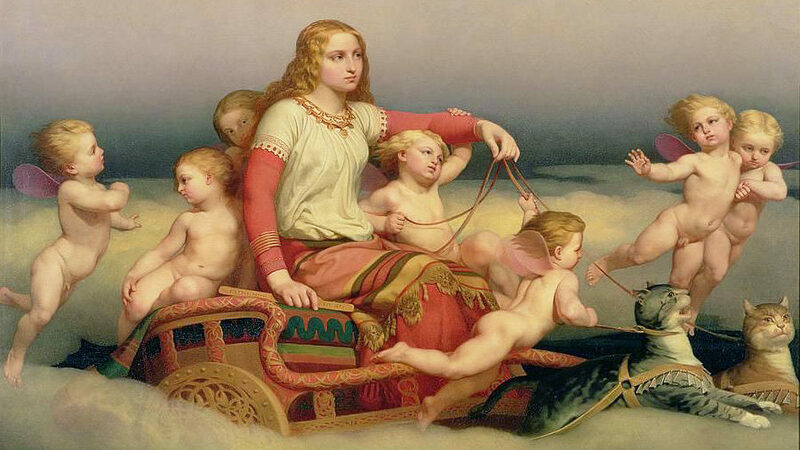 Featured above: The goddess Vanadis in her chariot pulled by cats. I have no idea. But There Already Were Automobiles: Cars have been using lighter materials than vanadium steel for a long time now, but Element 23 might be making its way back into cars in the near future. Vanadium can be used to create new kinds of batteries that can be charged extremely efficiently, and can last for decades. Northern Overexposure: It seems kind of unfair that we didn’t get an element with an etymologically Spanish name when we had the chance, since there are so very many elements named after Scandinavia. It might not seem like a lot yet, but just wait till we visit Ytterby. Some Clarification: Some people would probably like me to point out that the “Tunicates eat their own brain thing” is not entirely accurate, because once they’re anchored in place, they do develop a new cerebral ganglion that’s actually much bigger than its old one. Is that supposed to make it sound less incredible? Because I know that if I were to eat my own brain, I wouldn’t proceed to grow a new one that’s the size of a garage! And it is pretty fair to draw the comparison between tunicates and humans, because we’re more closely related than you might guess. Tunicates and humans are both members of the phylum Chordata, the taxonomical group that includes all vertebrates. We here at the Episodic Table of Elements are on the record as being firmly opposed to the Great Man Theory of scientific invention. We promote the less dramatic but more honest perspectives of multiple discovery and iterative invention. So it shouldn’t surprise you when we say that Henry Ford did not invent the assembly line. Before that, Venetian ships were outfitted in stages as they floated down canals going as far back as 1100 CE. And for centuries before that, East Asian empires mass-produced farming tools, weapons, and armor. That seems to be how things go for Element 23. It diligently performs critical duties in the background, rarely noticed, barely even known, and usually, someone else seems to get the credit. Today, we’ll peer behind the curtain at vanadium. There are animals that do find a biological use for vanadium, and they are correspondingly bizarre. You won’t find them on land. They dwell in the dark and briny deep of the ocean, a realm so far and foreign to us that the beings who live there might as well be from another planet. If you think I’m exaggerating for dramatic effect, please allow me to elaborate. The vanadium-seeking animals in question are called tunicates, and they have lived on Earth for over half a billion years. A newly hatched tunicate is a very simple creature, little more than a single bulbous eye with a long, sinuous tail that propels it through the water. It doesn’t get much more efficient than that for location scouting. But there are some downsides. For instance, without a mouth, the tunicate cannot eat! Wherever it decides to hunker down, the tunicate commits. That’s its forever home. Almost immediately upon fixing itself in place, it recycles the part of its body called the cerebral ganglion. The tunicate eats its own brain! But we don’t really know why. It’s not some kind of accident. Their bodies can contain as much as ten million times as much vanadium as the seawater they’re immersed in.14 They might employ vanadium as part of their immune systems, or perhaps as some kind of deterrent to predators. One very observable side effect this has for the tunicates is that their blood is a pale green color. Like Spock, from Star Trek! I told you they were practically aliens. This anomalous abundance of Element 23 caught the attention of the American military during World War II. They considered harvesting tunicates as a source of the transition metal for the war effort. But, much like the enigmatic sea creatures, it’s hard to say exactly why the military was in search of vanadium. Some scientists were told that it was part of a top secret project, with the obvious implication being the atomic bomb, for those in the know. Vanadium is sometimes found in the same veins as uranium, but the real explanation was probably much more mundane. You might not be accustomed to thinking of armor as something that goes on airplanes, but especially during World War II, they needed armor just as much as a soldier’s helmet and a ship’s hull. Air missions were a harrowing ordeal during the Second World War, especially bomber runs. A crew would spend hours at a time flying over enemy territory, taking fire all the while. Mortality rates were astronomical. Anything that could improve a flight crew’s chance of survival would be welcome help. But the engineers couldn’t just cover the whole plane in vanadium steel. It’s pretty lightweight, but this was a circumstance where every pound mattered. Too much armor, and the planes would guzzle fuel and lumber around the sky, if they could even take off at all. Too little armor, and they’d be easily shot down. So someone had to figure out which spots on the airplane really needed armor, and which could skate by without. Ultimately, this was a math problem, and that meant that it fell under the jurisdiction of the Statistical Research Group. See, in the early 1940s, the most capable calculators in the world didn’t have processors made of silicon, or even vacuum tubes. They were made of flesh and blood. Military officials provided the SRG with data that showed where their airplanes had suffered the most damage. The wings and fuselage were often riddled with twice as many bullet holes as other parts of the plane. Clearly, the officials said, we need to reinforce those areas. But just how much armor should they use? The problem, he explained, was that they weren’t looking at the whole picture. The military could only observe the planes that managed to limp home from a mission. If a bomber made it back to base with a fuselage full of holes, then that was where the plane didn’t require reinforcement. If a plane was hit in a particularly vulnerable spot, like the engine, then it wasn’t going to make it back to base. The solution was to put the armor where there were no bullet holes. It’s the kind of error that people make every day. For instance, if an ambitious young entrepreneur only ever studies companies that have found financial success, they’ll never be aware of the most common pitfalls young businesses fall prey to. It’s not where the bullet holes are. It’s where the bullet holes aren’t. So some carefully placed vanadium steel was quite the defensive advantage for bomber crews in World War II. But that was far from the first time it had made a mark on the battlefield. For well over a thousand years, Damascus steel was prized around the world for its superior strength and ability to hold a razor-sharp edge. Forging a blade from the material required a high degree of skill, and unique manufacturing methods resulted in a dazzling pattern of bands running along the flat of the blade. Vanadium was the secret ingredient that lent such legendary strength to Damascus steel, but — in typical vanadium fashion — nobody understood that at the time. When the special vanadium-tinged reserves of steel ran dry, no blacksmith could understand why their time-tested techniques were producing embarrassingly average swords. It wasn’t until centuries later that anyone even realized there was a secret ingredient. If you manage to get a hold of an authentic sample, Damascus steel would make a beautiful addition to your element collection in vanadium’s slot. Or you could accomplish pretty much the same thing by going down to your local hardware store. You can pick up a vanadium steel socket wrench pretty cheap. Granted, it probably won’t exhibit a mottled pattern of intricate folds lovingly crafted by a burly blacksmith, but for our purposes, it’ll do just fine. If you prefer jewels over tools, there’s a vanadium sample for you, too. Some emeralds acquire their green color from flecks of element 23 distributed throughout the beryl crystal. But you’ll want to get that thing certified — chromium can accomplish the same effect. For the discerning collector, pure vanadium can be hard to come by. It’s probably most easily acquired from industrial sources — stock to be added to alloys, and whatnot. Because for as useful as vanadium is, there just aren’t any really flashy uses for the raw stuff. That seems pretty appropriate. Vanadium may be beautiful, but it’s also mysterious: secretly doing the heavy lifting in the ancient world’s strongest steel, or slowly accumulating in bizarre life forms for unknown purposes. Perhaps we should count ourselves lucky that Vanadis has answered the door at all. Thanks for listening to The Episodic Table of Elements. Music is by Kai Engel. To learn about how tunicate behavior can get even weirder, visit episodic table dot com slash V.
Next time, we’ll take a shine to chromium. This is T. R. Appleton, reminding you to live long and prosper. My Life And Work, Henry Ford and Samuel Crowther. McClure’s Magazine, Volume 54, March 1922. The Elements Of Power, p. 52. David S. Abraham, 2015. Managing Technological Innovation: Competitive Advantage From Change, p. 158-159. Frederick Betz, 2003. American Council On Science And Health, V Is For Vanadium: Versatile, Valuable, And Very Colorful. Josh Bloom, January 13, 2018. The Journal Of Chemical Education, The Scientific Contributions Of Don Andres Manuel del Rio. Mary Elvira Weeks, 1935. Bull. Hist. Chem., Volume 28, Number 1. Andres del Rio, Alexander von Humboldt, and the Twice-Discovered Element. Lyman R. Caswell, 2003. Education In Chemistry, Vanadium. John Emsley, May 1, 2012. Elementymology & Elements Multidict, Vanadium. Safe Use Of Chemicals: A Practical Guide, p. 101. T. S. S. Dikshith, 2009. Advanced Nutrition And Human Metabolism, p. 559. Sareen S. Gropper and Jack L. Smith, 2013. Encyclopedia Britannica, Sea Squirt. Last updated March 27, 2014. BioOne, The Mechanism Of Accumulation Of Vanadium By Ascidians: Some Progress Towards An Understanding Of This Unusual Phenomenon. Hitoshi Michibata, 1996. A Study Of Ballistic And Metallurgical Characteristics Of Steel Aircraft Armor, J. M. Hodge and H. V. Joyce. The Naval Research Laboratory, June 1948. Journal Of The American Statistical Association, The Statistical Research Group, 1942-1945. June, 1980. Abraham Wald And The Missing Bullet Holes, excerpted from How Not To Be Wrong by Jordan Ellenberg. You Are Not So Smart, Survivorship Bias. David McRaney, May 23, 2013.